Today was interesting. I find i am not very thirsty still. I had a 4 glasses of water today. I had a bit of a running nose that felt like a detox running nose since what i am sick with is more of a bronchial coughing all the time thing. I had a low grade, very low grade, headache for about 10 minutes today. It passed very quickly. My focus at the beginning of the day, i was pretty focused. I was up a lot at night coughing. I dont normally take anything for fevers, coughs, or other ailments, so it was pretty easy for me to not take anything and just let my body does it immune system magic. 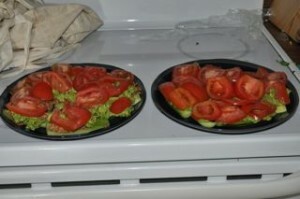 I noticed when eating, I would get hungry, eat less then half of what i made myself, and start feeling very full. I also got hungry earlier, so i had a green smoothie today. It was amazingly good, and I started craving another one at lunch time. I feel like i am either preparing food, food shopping, eating, or doing dishes all day. I used the vita-mix blender 5 times today and the cuisine art food processor, 6 times. Normally i use the blender more then the food processor, but i had alot of guacamole request. I also used it to shred carrots, that is a great way to chop carrots. On a scale of 1-10, with 6 being my normal status-quo, i was at a 4 today. I have been at a 3 to 4 level for about a week trying to kick this cold. I also noticed, for the last couple days, i have not had an afternoon sleep crash. I dont yawn or look longing for a bed and an hour free time. I lost another .5 pounds which means i lost a total of 3 pounds so far. Today, i spent over 4 hours on food prep (including an hour running to the store). The stuff i am making it not complicated, it is just so time consuming. I also went to the grocery store. Again. This is the 4th time in 4 days. If this keeps up, I dont think this is really sustainable for me. I think this would be very different if i was just doing this for myself, but i have 2 other people i am feeding. Today, i did no snaking except for 4 grapes. No nuts, no seeds, no stray pieces of fruit. 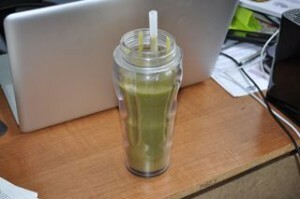 Breakfast started out with my so far favorite smoothie – banana, strawberry, maca, spinach. Yum. I sucked this down in about 10 minutes. This was fast to make. 15 minutes to make, pour everyones glasses, wash the blender and put everything away. Lunch was more of that cucumber goodness i made yesterday. I put the sunflower pate on moms again, but left it off of mine. 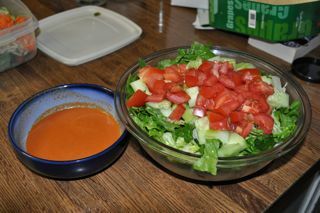 While i am sure i will get better as time goes, this simple meal took me almost 60 minutes. 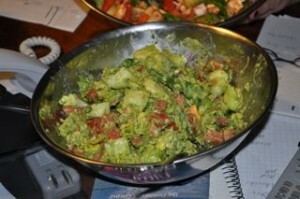 Making guacamole, slicing, peeling, washing, drying, dishes, taking pictures. Today i served it with a knife and fork, so much easier then eating with hands only. It was yummy. 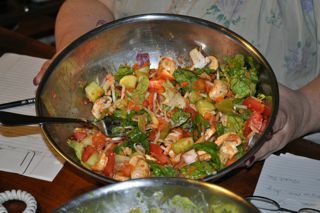 Dinner, I made huge salads. No one actually finish theirs. This took about 60 minutes as well. I made a bell pepper dressing for Lindsay and mom since they love those and i am allergic, and i made an avocado dressing (read that as guacamole) for myself. Normally, i would not want to eat this many avocados in a day (well, i would want to taste bud wise, but not health wise), but i wanted something heavy. Here is Lindsay’s. The salad dressing for hers and Moms was taken from Raw Food Made Easy For 1 or 2 People . It the bell pepper version of the creamy cucumber dressing. However, this was way to tart for them. I added some raw soy sauce, a bit more red onion, and it saved the day! All i wanted in my salad, was a little lettuce, tomato, and cucumber (pretty much the same thing as lunch, i have to get a little more variety in). I put a couple extra things in my sisters salad (carrots), and moms got a lot more stuff (onions mushrooms, bean sprouts). If you are counting the time, the other time was spent making smooties for mom, freezing grapes (one of Lindsay’s favorite snacks), etc. Lindsay wrote her day 3 blog post! Lets see what she has to say. The last couple of days have been one hell of a ride. I’m not sure if the discomfort that I am feeling is because of the eating/detox or the other stresses in my life, but it’s a interesting experience either way. Last night I fully intended to write my journey of day 2; however, my eyelids gained about 40 pounds each and had to be closed for the night, so my apologies. I was surprised when I woke up this morning to find that I was still sleepy…who knew that I could sleep 10 hours and wake up wanting more. I woke up feeling better, but feel yucky again this evening, I ate mostly fruit in the morning, to see if that would make me feel any better. It did for a bit, but then the discomfort returned. I am curious to see if it will subside in a few days as I grow more accustomed to this was of eating. Now for some awesome news: since we started this 3 days ago, I have lost 4.5 pounds! Also, my skin is looking better. I look forward to seeing the benefits continue to pile up. Until next time, I bid you all farewell. This entry was posted on Wednesday, March 4th, 2009 at 3:52 am	and is filed under Raw Food. You can follow any responses to this entry through the RSS 2.0 feed. You can leave a response, or trackback from your own site.